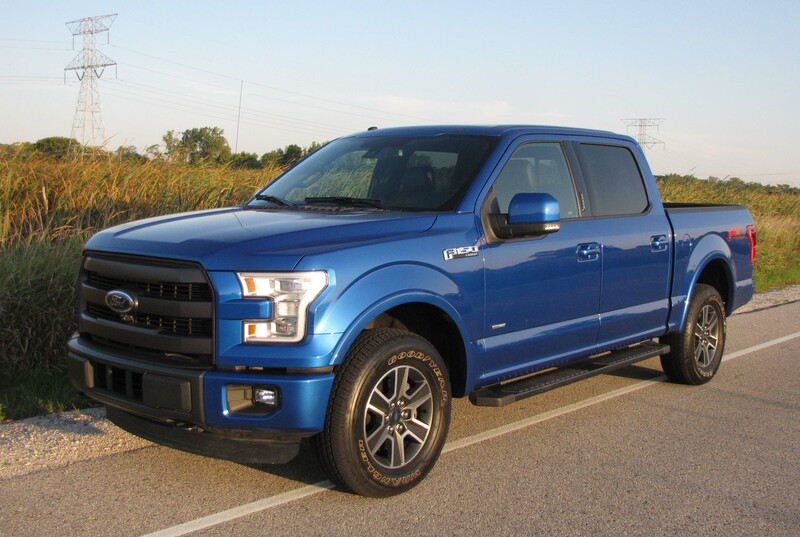 The test truck was rated 17 mpg city and 23 mpg highway, which may not sound great, but is an improvement over most trucks and better than the 14/18 mpg that the previous F-150 I’d driven was rated. This time I got 18.4 mpg in about 60% city driving and 40% highway. I can tell you from experience that 18 mpg is about as good as I’ve ever gotten in solely a highway drive in other pickups, and highway driving is generally where these big boys are most efficient. For instance, I managed just 14.6 mpg in mixed driving in that Tundra I drove earlier this year. Now I know that most folks who buy a pickup are less concerned with fuel mileage than towing capability, and the F-150 continues to deliver on that end. 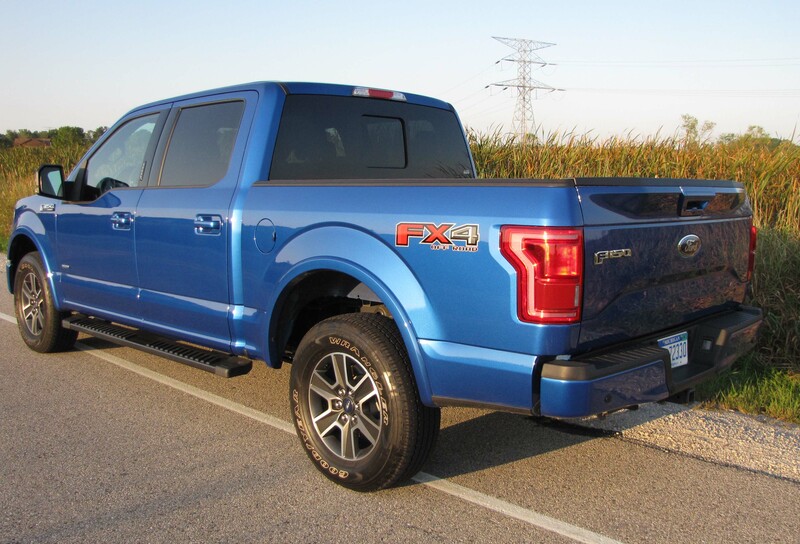 Towing capacity for the test truck, which added the optional ($400) 3.5-liter EcoBoost V6, is nearly 12,000 lbs. 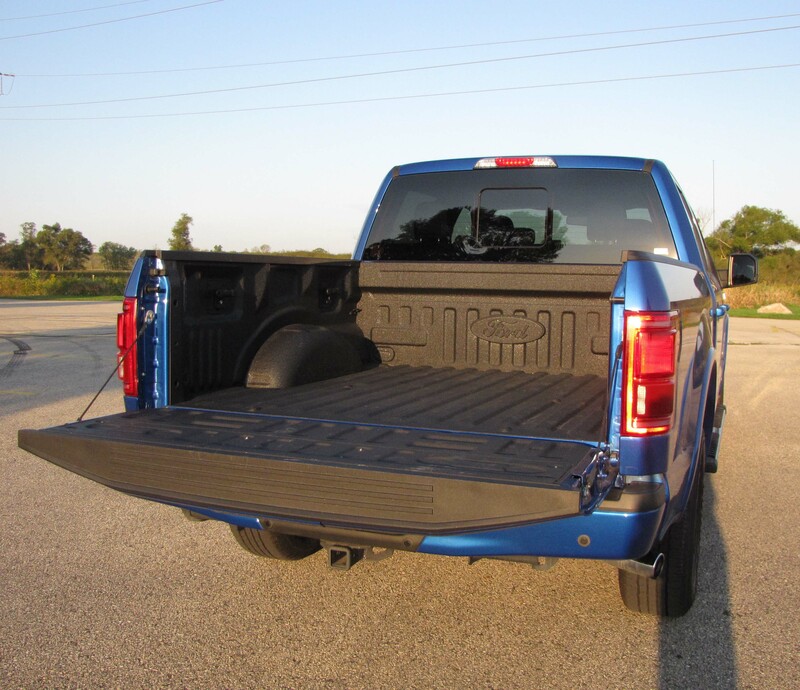 That’s near the top end for non-heavy-duty pickup tow capacity. This being a SuperCrew with two full-size rear doors so it’ll comfortably carry five adults, the towing rating is a tad lower than a SuperCab (rear-opening smaller rear doors) and Standard cab (2-doors). My blue beast also had 4-wheel-drive, Ford using a dial on the dash to allow the driver to select between 2- and 4-wheel drive, including low and automatic settings. Easy to use! 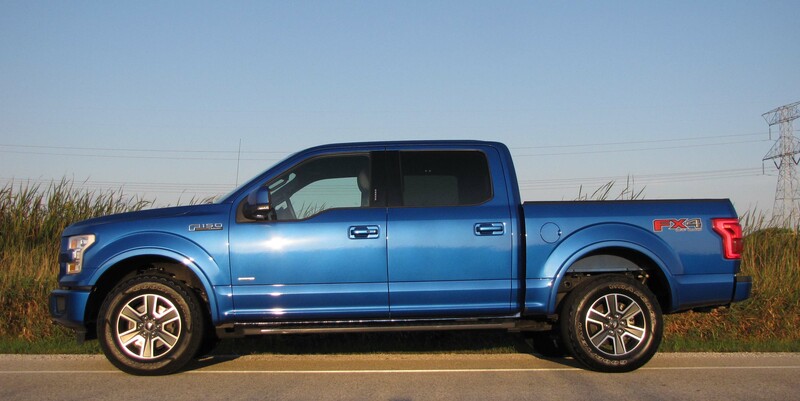 From a comfort and driving standpoint the F-150 mostly excels. The ride is well controlled and the long 145-inch wheelbase helps it bridge road bumps and imperfections. One would imagine that would also help off-road too. 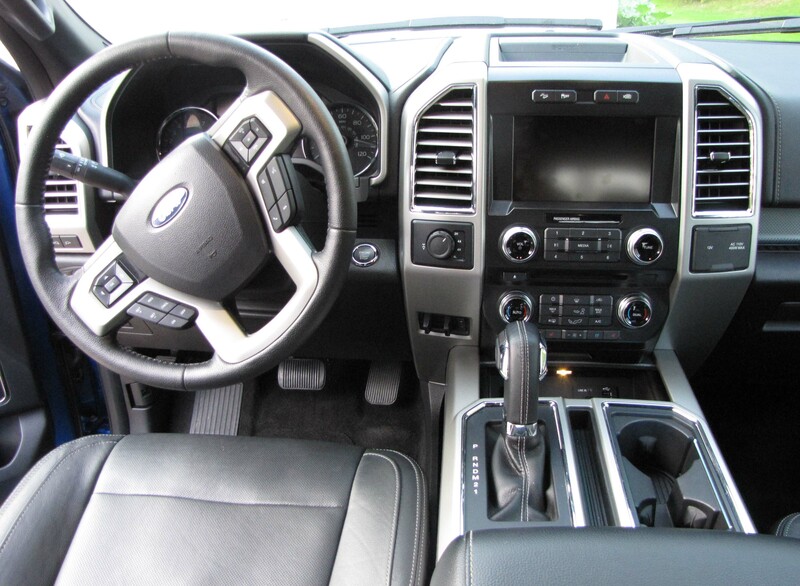 Where some other trucks seem to still have too much rebound after a serious bump, the Ford’s rebound is cushioned and comfortable. Riding around town was a pleasure in the F-150. Power from that 3.5-liter is solid too. It creates 365 horsepower and 420 ft.-lbs. of torque, so you can punch the gas pedal and get a quick boost as the twin-turbos give it instantaneous power. Standard on this model is a 2.7-liter EcoBoost V6 that is no slouch at 325 hp and a torque rating of 375. Two other engines are available, a 3.5-liter V6 that is not turbocharged. It’s rated at 282 hp and 253 ft.-lbs. of torque, and the big 5.0-liter V8 generates 385 hp and boasts a torque rating of 387. A 6-speed automatic transmission is standard and works well, plus the braking is first rate with big discs at all four wheels. Handling is not as precise as I’d like with a fair amount of play in the wheel. That means you can turn it a few inches one way or another without changing the vehicle’s direction. The wheel feel is mushy with little road feedback. Yet the Ford was easy to keep in its lane on the highway and some softness to the wheel may be OK if you’re towing a trailer that can cause a bit of vehicle sway, especially on windy days. Inside the truck was spacious and quiet, easily the quietest pickup I’ve ever driven. Seats are fairly flat and comfortable and this one had heated and cooled front seats, heated outboard rear seats and a heated steering wheel. Nice! 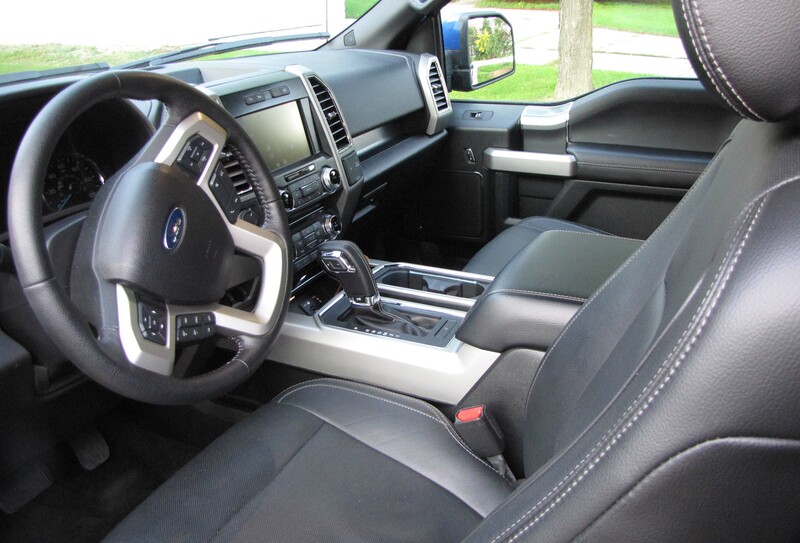 Seats were black leather with a black dash that featured pewter trim by the air ducts and on the steering wheel hub. There was slight chrome trim on the ducts inner edge and a vertical strip of carbon fiber-look trim on the doors and a bit on the passenger’s side dash. The instrument cluster looks a bit like that of an airliner, a lot of numbers lit up, but everything was easy to see and read. I like that there are buttons for the climate controls and radio, plus dials for tuning. All are easy to understand and use while driving, plus big enough to use while wearing gloves in winter. Naturally there’s a big video screen for radio and navigation and the back-up camera. This model also has a 360-degree camera that shows you your vehicle from above and is extremely helpful in navigating tight parking spots. Other major pluses are a giant dual sunroof ($1,295), big mirrors and easy-drop tailgate that slowly lowers so as not to bang down and make a racket. Ford’s cut-down front side windows also aid visibility considerably. They help you see the mirrors better, plus allow some visibility around the mirrors. A lot of the extra goodies come as part of the Lariat package, which adds nearly $7 grand to the price. But if you are going whole-hog on your pickup this is the stuff you’ll want. After all the options the test F-150 went from its $44,465 base price to $56,360. Some may be shocked at that, but full-size pickups and SUVs run about $50 grand most of the time now. 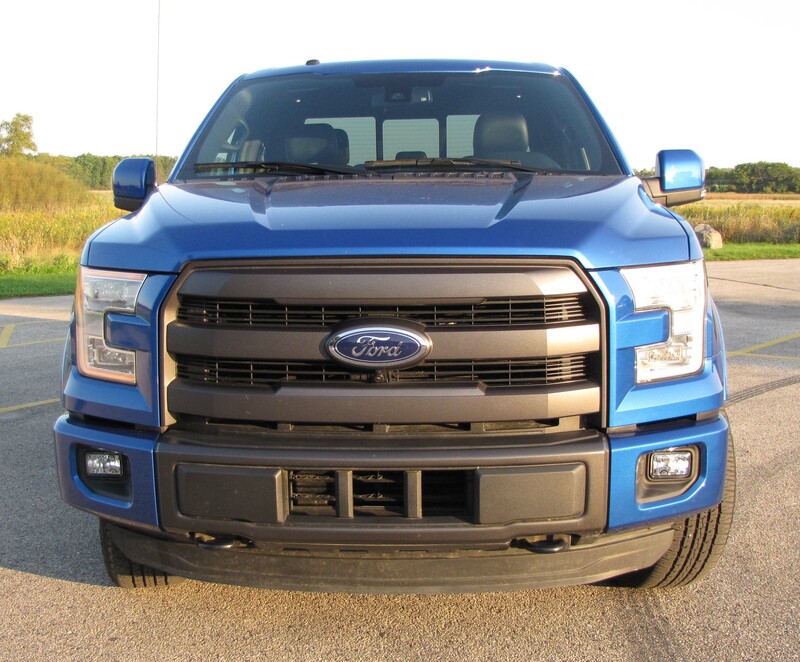 My bet is that Ford’s F-150 will not lose a beat in the sales wars, even if most of us would rather be locked in a steel cage than an aluminum one when a bear attacks. Sorry Chevy! Hits: Spacious and quiet interior, good ride, power and mpg. Comfy seats, heated front and rear seats and wheel, cooled front seats, power sliding rear window and giant sunroof. Helpful 360-degree camera, good controls and large buttons and knobs, cut-down front side windows aid visibility, big mirrors and easy-drop tailgate. Misses: Price, steering feel is mushy and too much play in the wheel. Oh, that’s right, a pickup is for hauling! The tail is easy drop, just unlatch and it easily lowers with no clunk or bang! Previous Post2016 Mazda MX-5 Miata ClubNext PostIt’s alive!